I have to admit though, Project Wings (not the final name, I haven’t figure out one for it yet) wasn’t the game I had in mind when I started out my game development. It was actually the result of a chain reaction of me failing to follow through all my previous ideas. 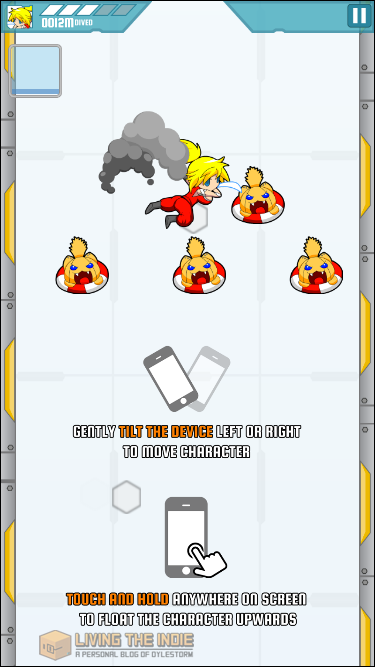 Originally, I wanted to create a simple “shoot to defend” game, where the player will tap on screen to destroy objects while making sure the damsel in distress is safe from harm. From a coding and graphics point of view, it was the perfect game idea to start off with, at least at the time. I didn’t have to create objects that requires a lot of animation and no complex coding to deal with. It was just simply “spawn object from top, make them fall. Player ‘fires’ on object, object get destroyed. If the damsel in distress gets hit by an object, reduce reduce score by X amount”. Sounds easy no? Unfortunately as development goes by, I started to realise that the game gets boring really fast. All objects fall at a linear path, with the difference being the drop speed of each individual object. Long story short, I couldn’t figure out how to improve and expand the game beyond the original concept. Looking back at it now, there were actually a lot of ways to make the the gameplay much more interesting but I was already burned out. Next, I decided to revisit an old project where you have a character that’s free falling, controlled using the device’s accelerometer ( for moving left, right) and touch screen (to float the character upwards). The game’s objective was to move around destroying enemies while avoiding traps such as bombs and death spikes. Rather than proceeding straight on with the development, I decided to test the game’s controls with a few friends. This is not something I normally do as I have this misconception that letting people know about your game early is bad as an indie developer. Yes, I was worried that other developers might steal my idea or game graphics. I soon realise that having people know more about your game far outweighs that negative thought. If they do want to steal, they would have done so regardless. The controls couldn’t keep with the game’s pacing. In other words, it’s so imprecise to the point that it feels stressful playing the game. The accelerometer’s sensitivity varies from one device to another, at least that’s the feedback I’ve gotten from Android users. After more testing, my final conclusion was that this control scheme just wasn’t suited for the game I had in mind. So off it goes into the ‘Return-to-this-later’ folder. Back to square one. At this point, the burned out feeling was really getting to me. I was exhausted and tired from the lack of progress. Not to mention my motivation was at an all time low. 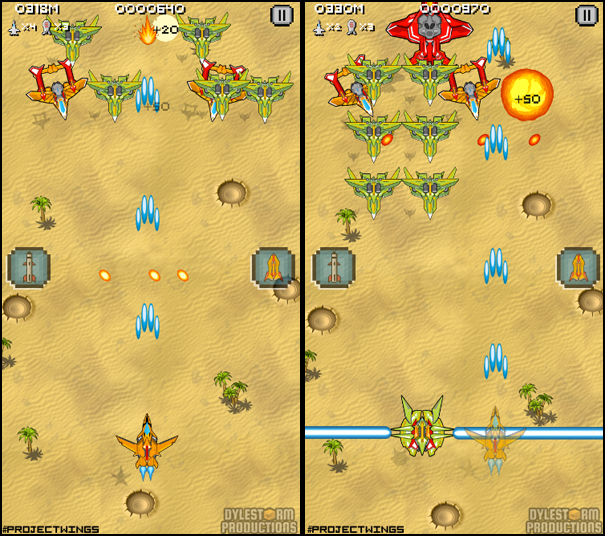 That was when my wife gave a suggestion “why not make a vertical shooter like Sonic Wings?”. It wasn’t a bad idea, as a matter of fact that idea is probably better compared to what I had previously. I love vertical shooters (personal favourite is Sonic Wings Special on the PSX) and there are a lot of similar games out there I can refer to. So why didn’t I start off with Project Wings? Work-In-Progress Project Wings for iOS and Android. Stage background currently are just placeholders. Throughout these past 2 months, I’ve learned an important lesson and that is to have beta testing regularly. The amount of feedback I have gotten are invaluable and it helps me understand what works and what doesn’t. Of course, you should also take each feedback with a grain of salt and not go blindly implementing whatever people say. In the end of the day, it’s still your game. 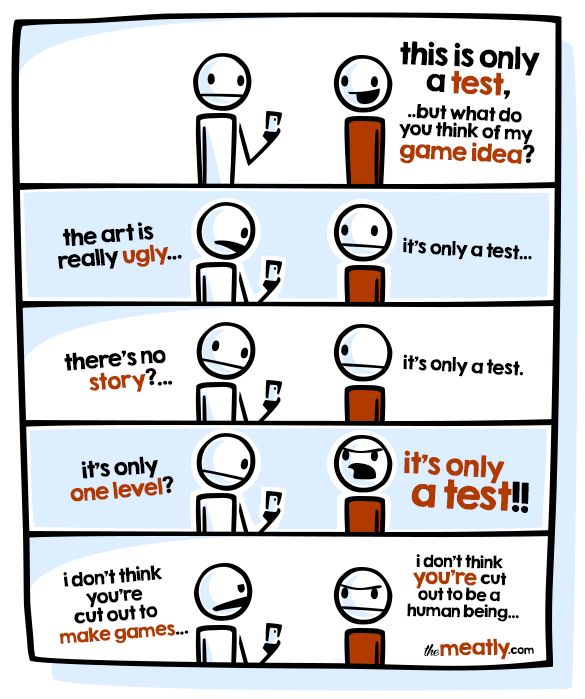 I shall end this blog post with a strip from one of my favourite webcomics, theMeatly. I pray that all indie developers out there would never have to come across such beta tester. Cheers!